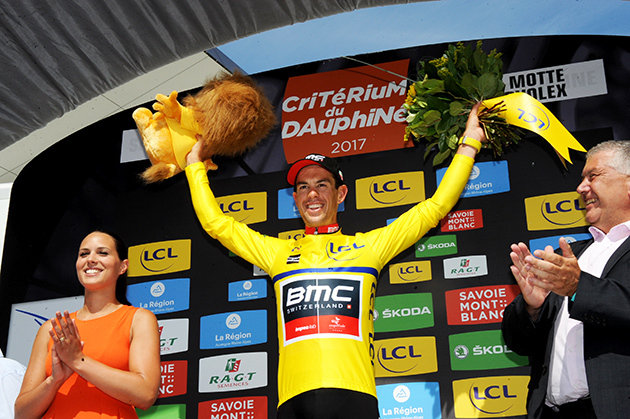 9 June, 2017, La Motte-Servolex (FRA): Richie Porte narrowly missed taking a second stage win on Critérium du Dauphiné stage 6 in a nail-biting four-man sprint to the line, taking second place and inheriting the leader's yellow jersey. After four flat stages and a time trial, stage 6 was the first General Classification battle in the mountains with the hors categorie Mont du Chat climb in the last 30km and the tricky descent to the finish line set to shake things up. Multiple breakaway attempts played out in the opening 15km before six riders went clear and gained a solid advantage of almost eight minutes. The peloton controlled the race situation for the first half before the teams eyeing the stage win started to bring the six riders back on the approach to Cote de Jongieux. With 30km to go as Mont du Chat loomed, the breakaway's advantage was down to five minutes. 5km later, it was Porte's BMC Racing Team teammates who were at the front of the bunch. Alejandro Valverde (Movistar Team) was the first rider to attack from the General Classification group on the ascent, as up ahead the breakaway started to split apart. Porte stayed calm and as the virtual yellow jersey, he responded to each attack to bring the group back together on multiple occasions. Fabio Aru and Jakob Fulgsang (Astana Pro Team) launched a solid attack and as Porte responded, it was only Chris Froome (Team Sky) who could stay on Porte's wheel. The duo eventually picked up Fulgsang and the trio reached the summit 10 seconds behind Aru. On the downhill the trio caught Aru and the quartet navigated the tricky descent together before it flattened out 3km before the line. In a rare sight, four General Classification riders went for the sprint, and as they crossed the line it looked like Porte was the winner. A photo finish revealed Fulgsang just edged Porte out of the win but Porte was able to take consolation in the yellow jersey. Richie Porte now wears the yellow leader's jersey. Porte now leads the General Classification by 39 seconds over Froome and 1'15" on Fulgsang with two more days in the mountains to come. Richie Porte: "I'm really happy with how the stage went. It really came down to all the leaders racing one on one. No one really had any teammates except Aru. I wasn't really looking forward to coming down that descent so, to come through that stage was good. In the end it was fast but it went well. 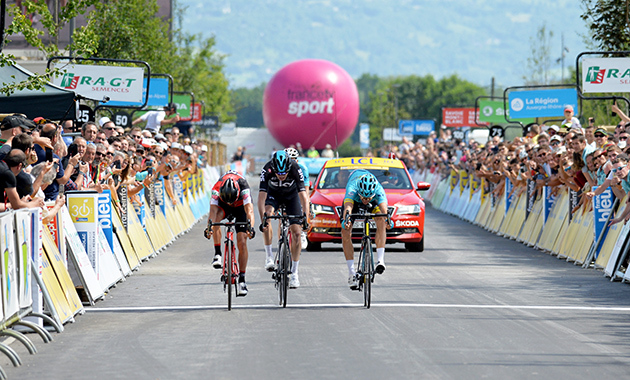 I came so close to the stage win in the sprint, although maybe it was not the most exciting sprint with four GC guys. But, it's great just to have the jersey. I know it's an uphill battle to keep it but I think today went really well." "We went fast up the climb but coming down there was a lot of speed so it was nice to get down safely. From KM 0, the guys were on the front and we didn't have much help until the final with AG2R La Mondiale. There was a lot of attacks but my team stayed calm and I was happy to come over the top with just me, Froome, Aru and Fuglsang. It was a good stage and a crazy descent in the end but I think I am in a good place." "It's nice to have the jersey but I know that the next two days are going to be super hard. But, I feel up to it and we have the team here to try and finish it off on Sunday. I think I had the target on my back this morning but I have a fantastic team here. I feel good. I'm in good form and I would love to keep this jersey until Sunday." Fabio Baldato, Sports Director: "We started as if we had the yellow jersey on our back. We knew Lotto-Soudal wouldn't want to control so we were focused on the team from the beginning. There was a strong, dangerous move of 10-15 guys but then a good group of six riders went. We let them go and Serge Pauwels (Dimension-Data) was the biggest threat at 3'38" on GC. We were riding for the yellow jersey, not the stage win. We let the breakaway go out to more than eight minutes knowing we could close 4-5 minutes before the climb. Everything went well. Ag2r La Mondiale were motivated for the stage and that made it easier for us." "Riche was really strong on the climb. He was smart and calm, and followed the right riders. Then, he waited for the last 3km before he went deep. The descent was perfect and it will give him more confidence. We missed the victory. I think without the movement of Froome, Richie probably would have won as he looked really fast. Now, we defend the jersey. Richie is for sure one of the strongest here and we have a great team. It won't be easy but we are in a good position." Everyone in the peloton was waiting for the first important climb of this Critérium du Dauphiné and the verdict has been significant: it speaks about the two riders of the Astana Pro Team, the Danish Jakob Fuglsang and the Italian Fabio Aru, who did the most important attacks, conquered the Mont du Chat prize and won the stage. “We worked really good as a team today – said Jakob Fuglsang during the interviews – both me and Fabio we demonstrated the training we did to prepare the Daupiné and the Tour it was a very high quality work and today on the uphill we were really confident. “We knew the climb because we tried it in the days before the Dauphiné – continued the Danish – so we had the right gears on the bike and we could adjust the effort while climbing… before the start of the climb I asked to my team mate Valgren to bring us at the front and he did an extraordinary job: this victory is for Michele Scarponi but it is also for the entire Team who did a great stage today. Jakob Fuglsang won this sixth stage of the Dauphiné beating on a small sprint respectively the Tansmanian Richie Porte (who is the new GC leader), the British Christopher Froome and the team mate, the Italian, Fabio Aru. The new general classification sees Fuglsang in 3rd position at 1:15 and Aru 5th at 1:24. Tomorrow, seventh stage of this Critérium du Dauphiné, Aoste – Alpe d’Huez (168 km) with the Col du Cucheron and Col de Porte in the first 56 km and then in the final the climb to Alpe D’Huez (3.7 km at 7.2 %) proceeding through the Col de Sarenne (15.3 km at 6.9 %). Cannondale-Drapac brings a diverse team to the varied Tour de Suisse, which begins with a six-kilometer prologue in Cham on Saturday. The nine-day race includes two time trials, three summit finishes and four stages that could be split between sprinters, rouleurs and breakaway artists. American time trial champion Taylor Phinney and Ryan Mullen have their sets firmly set on the opening stage and final day time trials. Mike Woods, Hugh Carthy and Joe Dombrowski aim to show themselves in the mountains. Paddy Bevin and Sep Vanmarcke will focus on the stages that finishes in small groups or reduced bunches. Lawson Craddock will play a key support role across all terrain. Ryan Mullen hopes to continue his progression in the race of truth. The 22-year-old delighted in fifth place in the time trial at the 2016 Road World Championships in Doha and slotted into ninth place in the final stage time trial at Tirreno Adriatico in March. With the start of the Tour de France coming only 21 days after the start of Tour de Suisse, Cannondale-Drapac will take special care with its likely Tour starters. By Marc Sani: TAICHUNG, Taiwan (BRAIN) — An article that popped up on a Chinese website that covers venture capital investment caused a stir last week. It reported that Ofo, a Chinese bike sharing company, was looking to purchase Giant Manufacturing. Irene Chen, Giant's senior global marketing executive, quickly scotched that story, telling BRAIN, "It's not true." Chen also said that the company had knocked that rumor down in China. However, it was the source cited for the purchase that ramped up attention and speculation, especially in Taiwan. It was the founder of Didi Chuxing, Cheng Wei. His company essentially drove Uber out of China. The report first surfaced on China Money Network, a Hong Kong media company that follows China's venture capital and private equity markets for global investors. It has a following on a number of social media sites. The article claimed that Wei, also a member of Ofo's board of directors, suggested buying Giant during a recent internal forum held in Beijing. Didi Chuxing is a major ride sharing company that, according to its website, provides transportation for more than 400 million users in 400 cities across China through taxi, limo, bus, car rental as well as several app-driven ride sharing units including those for bicycles. The article noted that Didi had invested heavily in Ofo in September 2016. Wei joined the board as part of the company's investment in Ofo.